Many home theater enthusiasts subscribe to DSS (Digital Satellite Service) for their TV source. 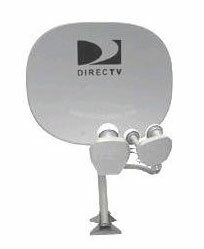 The two main DSS services are DIRECTV and DISH Network in the United States. EchoStar provides the DISH Network service. If your cable company offers a digital cable service, you can probably get just as many channels on that service as you can on a digital satellite service. Contact DIRECTV or DISH Network for information on their services and pricing. Both services offer digital transmission of their video content using MPEG-2 — with an increasing amount of their programming being moved to the even more efficient (more video in less bandwidth) MPEG-4 system. This digital transmission has advantages for both the satellite companies (because it lets them fit more TV channels into the radio waves over which their satellites broadcast) and the customer (because it eliminates the distortions that often occur in nondigital transmissions). Both DSS service providers are launching new satellites into orbit, outfitted with systems that support the newer MPEG-4 system. These new satellites are being used to offer more high-definition (HDTV) channels — both more nationwide channels (that everyone can get) and more local HDTV broadcasts. To pick up stations coming from the newer MPEG-4 satellites, you need a new satellite receiver that can decode MPEG-4. All current high-definition receivers available from DISH and DIRECTV are capable of this, but if you have a receiver that was made before 2005, you may need to replace your receiver with a newer model.